T410 Days are far from over. I picked up a used T410 on eBay for a dedicated linux box for at work and a machine I wouldn't mind leaving at work. Well I have since found myself using it constantly at work. it's fast and reliable and I'm typing this post on it now. It reminds me of why I love Thinkpad's so much not to mention this is a more powerful version of my first Thinkpad, which was a T410i with a Core i3 that gave me 6 years of faithful service. Just wanted to share. Re: T410 Days are far from over. I have one that looks like that, no camera or FPR, but it's got bluetooth. It's a little more worn but it has a nice 1280 LG screen. I've played with 4 T410s of a few types, including the early version with Nvidia 3100m 256mb vram (not Optimus), two 1440x900 models, and lately 1280 ones. The screens can be LG, AUO, or Samsung and vary from decent to horrible. All of them have varying levels of poor quality control. The Samsungs have window-screen effect and uneven backlighting, the LGs have consistent backlight bleed in the bottom right corner, and the AUOs have multicolored stage lights on the upper and lower edges of the screen. Ultimately the LGs are the clearest, brightest, and most vibrant with the best viewing angles. They are all also very bright, a common feature of these early LED model Thinkpads. Compare to a dim 1366 panel from a T430. The NVS 3100m is just a waste of electricity. It does enable a niche's worth of undemanding 3D games, but it's the 4-thread Core i series CPU doing most of the work. The CPUs are so fast in these. Slide in an SSD and you're booting Windows 7 in 10 seconds. Functionally T410s are great!! They're also relatively light and durable and the design is quite pleasant. The 1440 screen, compared to 1280, lets you have some extra space at the side of your screen, alongside your browser, but it's really a joke resolution with a funny DPI, in my opinion it's not worth paying extra over 1280 unless you can check the Serial Number and guarantee it's an LG. Even the LG 1280 is a better screen than the others. But I haven't looked at a 1440 in awhile so I may change my mind sometime. One thing I remember is feeling cramped in 1440x900. It's not enough of a boost over 1280x800. Now 1680x1050 on the other hand.... shame no hi-res Wide 14.1" panels were ever made. It is a very basic T410. But I picked it up for $60 so I'm not complaining. I just ordered 8GB RAM for it and going to put a spare 120GB SSD in it shortly. I wish I hadn't of given my brother in law my T420. I do miss the i7 and FHD screen on it. Now I'm searching for another one. Nice, it looks pristine! Reminds me of when I first got my T410 and I couldn't stop using it. I like the T410 myself, although it does run hot. It's been a very reliable machine to me for 6.5 years. The fan seems to be on its last leg, and I plan to buy a spare to have it ready when the current one quits. With how hot the machine runs, the fan is on almost all the time, so 6.5 years of service is impressive in my book. My T42 and T60 systems did not last so long before the fan had to be replaced. As for resolution - I would go for 1440x900 over 1280x800 any day. It may not be enough, but even a little extra space is better. I have more than several T410 and T410s models and a couple X201 models. I just did some testing with my W500 gaming and was disappointed with the performance compared to my T410S with Nvidia Graphics (worthless graphics card). I thought the T9900 would do better with the ATI graphics but it was not the case. The T410 is a solid performer. Get the 1440x900 model in T410 or nothing. I think the T61 is as far back as you want to go but with Nvidia graphics because on those machines youtube and web browsing are more capable than integrated graphics. The T400/T500 are just fine for an everyday thinkpad. The T410 with integrated graphics is basically the same performance as Nvidia graphics. There is really nothing the T410 still cannot do other than games. I love my T410. I moved it to the house for pen testing my work network. I just bought a nice X220 on ebay that I'm going to start taking to work with me. I'm tired of hauling my E550 to work and I'm just going to leave it at my church office now and haul around the X220. I bought on ebay the ultimate T410: according to the S/N, it has the LG 1440x900 screen and 512mb Nvidia 3100m Switchable Graphics. Top of the line i5 560m, needs RAM and a drive. Can't wait for it to arrive. Now I wonder what would happen if I bought a W510's i7 quad core and put that in*. Probably the stupidest idea ever. *Apparently impossible? According to http://forum.thinkpads.com/viewtopic.php?t=91494, even though looking at eBay pictures, the pins look the same as those of my i3 370m. This notebookreview thread http://forum.notebookreview.com/threads ... ty.438978/ also suggests that the Clarksfield i7 720QM fits in the same socket as Arrandale T410 cpus. W510 was also equipped with normal Arrandales or Clarksfield quad cores according to Thinkwiki. Final edit: it has been done but unsuccessful, according to the comments of this poorly titled video, https://www.youtube.com/watch?v=NhDucuwN22o . Shame. As you can see, vertical viewing angles are better than on the LG and Samsung. The Contrast of 400:1 is accurate as well. I can attest to the fact that it was genuinely an OK-ish display, not total crap like the other options. I have a pair of 410 units, one Intel, one Nvidia. They are pretty decent workhorses... the Nvidia one feels like it puts out substantially more heat for little purpose. Both are i5-520/540s, 4Gb, 120Gb ssd, Intel 53,6300 and they're decent machines if a bit heavy. Both have mediocre 900p panels. HOwever they are the older style IBM thru and thru with the non chrome logos. I paid $50 for each with no disc. I believe the 420 is not leaps and bounds better. I reckon the port locations etc. are worse. TonyJZX wrote: I have a pair of 410 units, one Intel, one Nvidia. They are pretty decent workhorses... the Nvidia one feels like it puts out substantially more heat for little purpose. They are decent performers, I dont think they crush Win7 as smoothly as they used to, I mean 1st gen Core i5... HOwever they are the older style IBM thru and thru with the non chrome logos. I believe the 420 is not leaps and bounds better. I reckon the port locations etc. are worse. I've got the i5-M520 on mine with stock 500 GB HGST HDD and 4GB RAM. Mine actually performs better with Vista Business than it did with Windows 7. The headphone location on the T420 looks absolutely horrid, but I prefer not having the USB ports all clustered together on the left. Having both a T410 and a T430 makes me want a T420 just to even out the collection. The thing that I like the most about the T410 is the lack of the chrome "Lenovo" on the lid. UMPC2024 wrote: I've got the i5-M520 on mine with stock 500 GB HGST HDD and 4GB RAM. Mine actually performs better with Vista Business than it did with Windows 7. The headphone location on the T420 looks absolutely horrid, but I prefer not having the USB ports all clustered together on the left. Having both a T410 and a T430 makes me want a T420 just to even out the collection. The thing that I like the most about the T410 is the lack of the chrome "Lenovo" on the lid. Even the X201 and W701 lost their Core2Duo versions' Lenovo lid badging. An interesting thing for Lenovo to do. They are interesting to collect and get into a good working order... free Win7 with each one! I have a 420, two 410 and a 420s... the S is lovely IMO and would probably buy another 420s w/ nvidia if I found one. Would probably not buy another 410 and even a 420 is getting on a bit due to the no USB3 thing. I have a line on some Dells of the same era and will give them a go for something different. Also have a X201 tab and would maybe look at 201 non tabs if I had to. TPFanatic wrote: Even the X201 and W701 lost their Core2Duo versions' Lenovo lid badging. An interesting thing for Lenovo to do. Yep. The *00 generation was the first one to have the Lenovo logo on the lid. It went away for one generation (*10/*01), and then came back in the *20 generation, with a slightly less obtrusive design, if I recall correctly. I had a T410 that I sold to my co-worked. He also has a T410 that he sold to his friend when he got mine because mine had slightly better specs. Wonderful machines with 8GB and an SSD. I hope yours serves you well OP. TPFanatic wrote: I bought on ebay the ultimate T410: according to the S/N, it has the LG 1440x900 screen and 512mb Nvidia 3100m Switchable Graphics. A followup now that I've played with this laptop a bit. I had an earlier T410 w/ Dedicated NVS3100m 256mb and proclaimed the NVS3100m a waste of electricity. The same is to be said about the Optimus NVS3100m 512mb version. Optimus switching is pretty cool, it switches between modes faster than the T500-era laptops with manual switching. Personally I'd like manual control as well, but that's only applicable in the BIOS. The 512mb NVS3100m is as bad at handling 3D games as the 256mb one. Both are marginally surpassed by the T500's 256mb Radeon 3650 which provides smoother performance. In games where the 3650 can handle 960x600 or 1280x800 smoothly, the NVS3100m still stutters at 768x480. Another factor to consider, the Radeon 3650 is a mainstream card while the NVS3100m has Quadro drivers. What the NVS3100m is meant to be used for is CAD and rendering. My new T410 also has a WXGA+ screen. Coming from a T500 with WUXGA, WXGA+ is practically as useless as WXGA. 1440x900 is a very marginal upgrade, only 100 more vertical pixels than 1280x800, and the DPI remains low at 120ppi. Even X200's 12.1" 1280x800 has a higher DPI. 1680x1050 and 1920x1200 are much more meaningful steps, with increments of 150 vertical pixels, and DPIs of 128 and 147 at 15.4". It's a shame that 1680x1050 and 1920x1200 were never manufactured in 14.1", because those are really useful resolutions and a T410 with 1680x1050 would be amazing. Similarly, the only useful resolution on 15.6" is 1920x1080, which is vertically comparable to 1680x1050. 1600x900 is as stupid as 1440x900. The only pro of the T410's 14.1" screen over 15.6" or 14.0" models is that the aspect ratio is pleasant to look at. It helps that the overall T410 design is aesthetically pleasing to us Thinkpadders. However this area is also a mixed bag, since T410 screen specs are terrible. In the end, if screen real estate is not a limiting factor to your work and you just want a fast laptop that tackles web browsing like a champ, a T410 will suit your basic needs. The WXGA+ and Nvidia options provide only marginal upgrades and do not expand the scope of the T410's usability. Luckily the T410 has a Displayport if you need more screen. I sold my T410 to a gentleman in need of a computer pretty bad and wanted a ThinkPad. He was rocking a T43 and it wasn't running well anymore. So I've been browsing eBay for another one since I sold my T410 and found a nice T410s. The 8GB ram and 160GB SSD are worth the $100 I got it for. Can't wait to it so show up and I can replace my crappy and heavy E550 that I've been hauling around. I love my classic Thinkpads. I've recently bought t410 since my x60 went dead. I tried to replace fuses but no luck. My t410 is equiped with camera, 4gb of ram 320 gb 7200 rpm 1280x800 na finally core i5 1 gen. I works pretty good and now I can watch YT with 1080 resolution without any jams! I know it withdrown machine but I'm the lover of thinkpads machines. The only thing I'm about to buy is usb 3 exprescard 34 to have usb 3 on my thinkpad. I forgot to mention tha I hate these new keyboards from t430 and above the are ugly and don't fit to history of thinkpads not to mention of the new touchpad which is unusable for me. Nice looking computer. My late father purchased a refurbished T410 in 2014 and it's my mom's daily driver now. Also, I've been using Linux Mint since Fall of 2016 when I bought a T400 off eBay that had it preloaded. I decided I like the OS and now run it on most of my computers (though alongside Win10 on a few). I immediately liked Mint because the GUI felt so familiar and from there, I decided to start learning Linux and now I'm experimenting with the XFCE desktop and after breaking a few installs, think I might be getting a hand for some of the messy parts of Linux. While it may be true for other or maybe even most Linux distributions, the only modern Linux I've used is Mint and one thing that impressed me was how either the hardware seemed built for the software or vice versa when running it on a few different ThinkPads including the T60, X301, T400 and T420. In contrast to Windows 10 which, as much as I love it (in contrast to many people here), is just broken on models as recent as the T420. To further go off topic, I've noticed the lower end and/or basic a machine (made before 2014) is, the better a chance it seems to have with Windows 10. BTW, as a mostly irrelevant side-note, has anybody else noticed that there's a Lenovo badge inset into the lid on the T400 and T420 but not the T410? Further note: As much as I like the T410, T420 and T430, I still wanna say if you care about the appearance of dust or grime on your laptop, those speaker grilles will start to bother you at some point. Total dust traps. In my experience, just lightly dust them (no force, just lightly swipe a dry rag over them to remove loose dust without pushing it into the holes) regularly. When dirt is somewhat visible in there, a terrycloth with dish soap followed by a clean cloth to dry. A toothbrush might help in some situations. However, at some point, you probably will have a situation wherein the only solution to getting them clean will be to carefully remove them (thin plastic sheets so not hard, just don't rip them) and run them under warm water with dish soap or degreaser for a minute, then dab them dry (not rub; fuzz will get stuck in them) and replace them on the machine (you will probably need new adhesive though it is possible to remove them, clean them and still have the old adhesive on and usable if you're careful enough). I did notice. All the **10 and **01 models are missing the badge, must be part of some minimalist phase they had going on. Funny thing is they created completely new lids missing the badges for models like the T410s, X201, and W701 which all had previous versions, the T400s, X200, and W700 with the badge. The lids are swappable between generations. As for T510 and W510, I presume they use the same lid design from *520,*530 laptops just without/with the badges. 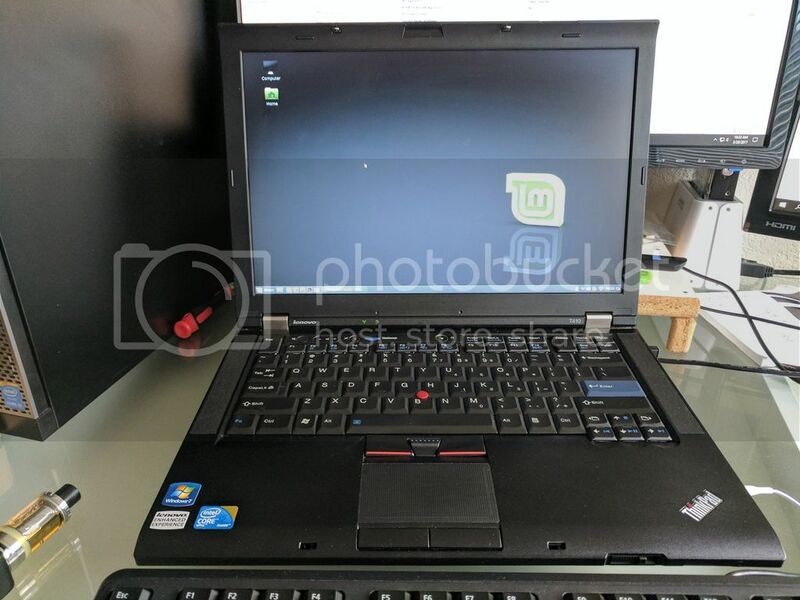 A similar switcharoo happened between X300 (T61 gen, no badge) and X301 (T500 gen, yes badge). It goes like this. Santa Rosa / 2008 / *61 / GM965 & prior: no badge. Montevina / 2009 / **00 / GM45: yes badge. Sandy Bridge / 2011 / **20 & newer: yes badge. T410 is the last great thinkpad ive ever use. personally i own T400, W500 and T420s but my daily driver laptop is still this baby. bought in 2011 in base specs, and even now in sept 2017 still working good for daily driver laptop, even for 2017 standart. I have developed a disgust for the 1600x900 panel in my T420 especially due to that laptop's gigantic bezels. T410 is so much more elegant! i have been Thinkpadless for the last few months and i now realize why i love them so much. i gave 5 Thinkpads away to thin my computer collection and now wish i had several back. This Dell 11" i'm on now has nothing on a good T61 or T410. You could always mod a ThinkLight like this guy did on HIS Dell.